Could you tell me where to get this awesome theme you are using? Is the conky theme part of it, too? Topic: Cinnamon Workspaces - What are they good for? Re: Cinnamon Workspaces - What are they good for? Have you installed graphics driver? I did and problem solved. Hit 'super key' and type driver. My shutdown is incredibly fast now. Topic: Default theme 'Mint-X-Grey' is wrong color. Default theme 'Mint-X-Grey' is wrong color. 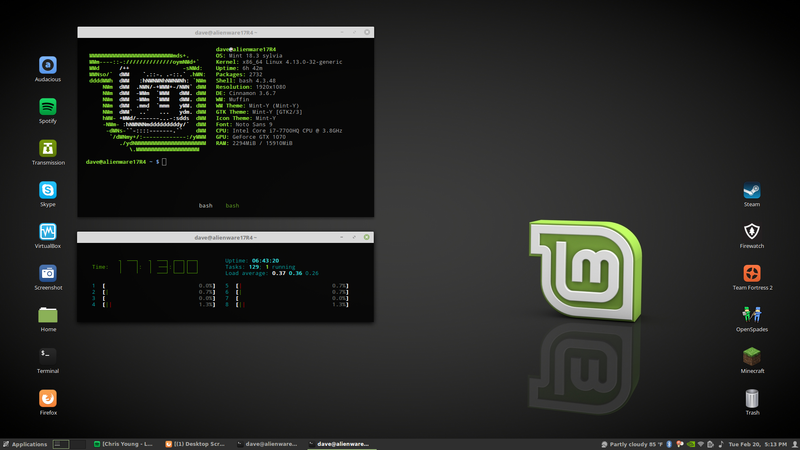 I'm using Linux Mint 19 Cinnamon and I have found out a theme is the wrong color. It is 'Mint-X-Grey' under 'Desktop' and it should be grey, but is green instead. It appears to be the same as the green theme. That looks very nice. Perfect! Topic: Installed URXVT and it has a jacked up icon!! How to fix? Installed URXVT and it has a jacked up icon!! How to fix? Topic: Mint 17.2 64-bit Cinnamon on imac 24"
Re: Mint 17.2 64-bit Cinnamon on imac 24"
I have the AMD Radeon HD 2600 XT resolution 1920x1200. Intel Core2 Duo 2.4 Ghz. 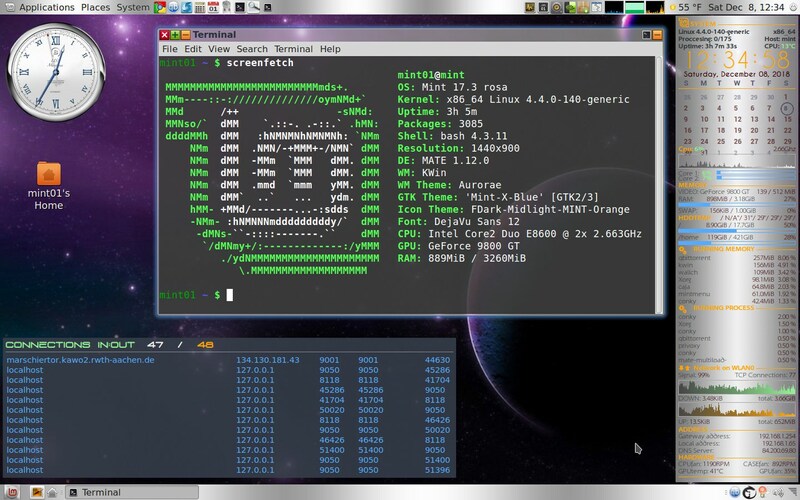 Actually, I have been playing with Arch Linux on my laptop and I am really liking it. Super fast and no problems. I'm also using i3 instead of Cinnamon. I installed with a USB (dd). Install was nice. I deleted everything on hd. Made it a msdos device, partied and then installed. It is fast. I like your desktop. Familiar, but slightly different. Linux Mint 17.2 Cinnamon 64-bit on iMac 24"
Topic: How to arrange icons on Desktop forever? Re: How to arrange icons on Desktop forever? Mint 17.2 64-bit Cinnamon on imac 24"
I have removed OSX and use Mint as my main OS. Thank you, Clem, and all the Mint developers for an outstanding Linux distro.